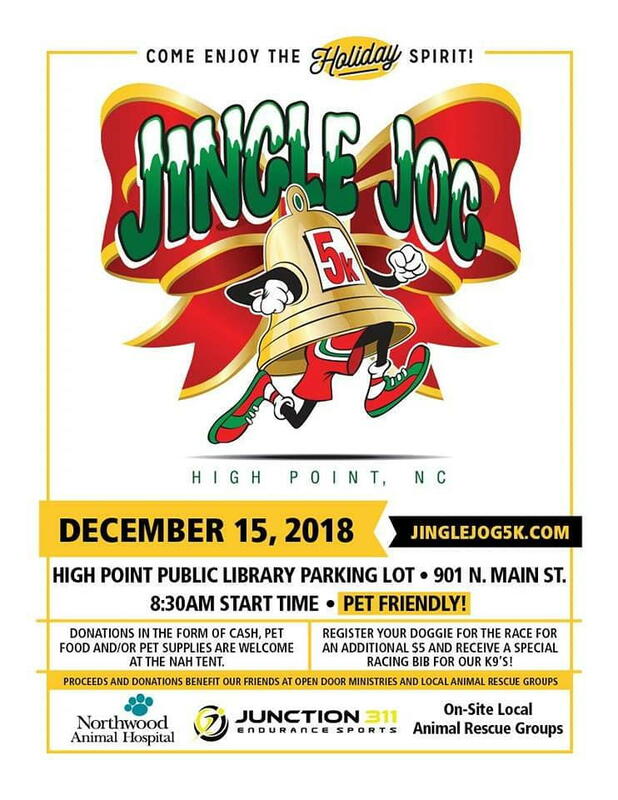 Come join us in High Point for a great run and some Christmas fun! There will be costumes, food, hot chocolate, coffee, finisher tee, and a special medal that is also an ornament for hanging on your tree. Help brighten the season and bring a non-perishable food item for the Open Door Ministries or Pet food or Pet supplies for our local animal rescue groups. Also, make sure to stop by our #NAH Northwood Animal Hospital tent for special treats and giveaways for pets and their owners! Please visit our Facebook page HERE! All H5k finishers will receive a finisher’s medal, which is also a Christmas ornament, and a race tee shirt Must register at least two(2) weeks before race to guarantee a shirt and size. 1st, 2nd and 3rd place overall will be awarded for Male and Female in the 5k.